Yesterday was one of those days where I had to remind myself of all the impossible things God has made possible. I needed the refresher because yesterday was one of those days where imaging I will ever have a baby seemed like a giant impossible! Oh did I forget to mention that while I was having “one of those days” my sister was in labor and gave birth to my twin nephews last night! Perfect timing right!! It was one of those days where the weight of infertility felt like it was crushing down on me. So its days like yesterday that draw me closer to God’s word and all the times God made the impossible possible. I turn to the book of Joshua and watch as the wall around Jericho falls and the city delivered into the hands of the Israelites, and all it took was some marching and some trumpets and a whole lot of Godly intervention. I look to the “mighty warrior” Gideon and how he took on the Midianite army with a minuscule army. Not only did they take them on but they were victorious. God made that possible. I can turn to the book of John and witness as Jesus turns five small loaves of bread and two small fish to feed 5,000 people. I don’t know about you but no matter how I try to slice a loaf of bread and a filet of fish I just can’t seem to get it to stretch that far. Again another impossible that God made possible. Now if these stories aren’t enough to snap me out of the funk I was in yesterday there are so many others I can turn to, to remind myself that God can easily make an impossible possible. But what usually brings me the most comfort is when I look to the women in the bible who also thought having a baby was impossible. What better source of comfort than to be inspired and comforted by women who have lived with the pain of infertility! When I look at them side by side and see the children God blessed them with it blows me away. Sarah, Abraham’s wife, was barren. The same Abraham whom God told would be the “Father to many nations”…. and his wife was barren. Years, and years, and years go by and still no baby for Sarah. But God was faithful to His promise to Abraham and Sarah. Even after the instance with “the other woman”, God still blessed Sarah with a son. This son would be the first in a long line of descendants. Isaac’s wife Rebekkah was barren. Genesis 25:21 shows us that Isaac prayed to the Lord on behalf of his wife because she was barren. God answered Isaac’s prayer and Rebekkah has not one son but two! Twin boys Jacob and Esau. Jacob is one of the most influential people in the Old Testament and the father of the twelve tribes of Israel. Rachel gave birth to Joseph who because of his faithfulness in all circumstances became the second most powerful man second only to Pharaoh. This positioned him in a place where he was able to provide for Israel during a time of great famine. Or how about Hannah. Oh dear, sweet Hannah. Her story tugs at my heart strings more than the others for some reason. Hannah prayed with all her heart for a precious son and God answered her prayers. Hannah gave birth to Samuel who later becomes a priest and a prophet, a man of God who anoints the first two kings of Israel. I can also read about Manoah’s wife who gives birth to mighty Samson who is one of the great judges in a time of great rebellion. And we can’t forget about Elizabeth. Elizabeth was barren but God blessed her even in her advanced age. Elizabeth gave birth to John the baptist. THE John the baptist! The very one that Jesus called the greatest man born of woman. As I look over this list of women I can’t help but realize that I am in good company. I’m sure at one time or another each one must have felt like having a baby was just impossible. For some it was old age, for others maybe it was just taking way too long. For me sometimes I feel like I’m getting too old. Sometimes I feel like its taking way too long and I’m running out of time. And then there are times when I look at the finances and the burden of paying for yet another round of treatment seems like an obstacle we just can’t possibly tackle. 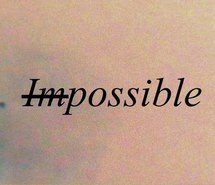 Thats when I have to remember all the impossibles God made possible. I have to remember that yes on my own it is impossible but I am not alone. The burden has been lifted! God makes even the most impossible possible! He did it for Sarah, Rebekkah, Rachel, Hannah, Manoah’s wife, and Elizabeth. And someday, in someway, when He says its time, He will do the same for me. Yesterday was my pity party, today I get back to God’s reality. Today I rejoice for the new lives that God has blessed us with. I may not be loving on my precious babies right now, I can love on my precious nephews. Thank you so much! I have to believe that other wise there is no hope! Your post yesterday really inspired me! Yes yes Yes!!! This is SO good! I talked about miracles yesterday too! !